Continuing to install some new light fixtures and I pulled these wires out of an old switch box. There are 3 wires sheathed in a cloth-like material. The three wires are then wrapped altogether in another cloth-like-material, and finally that is all in a ribbed metal conduit. I looked around online but couldn't definitively figure out what these are. Are these safe to use? What time period are these from? In answer to your question the wires you are looking at are part of a cabling system known a BX. It is a lot like AC or MC only it doesn't have a grounding conductor and the conductor insulation is a type RH or RHW which is a rubber insulation wrapped in cloth. The other cloth is just fill. 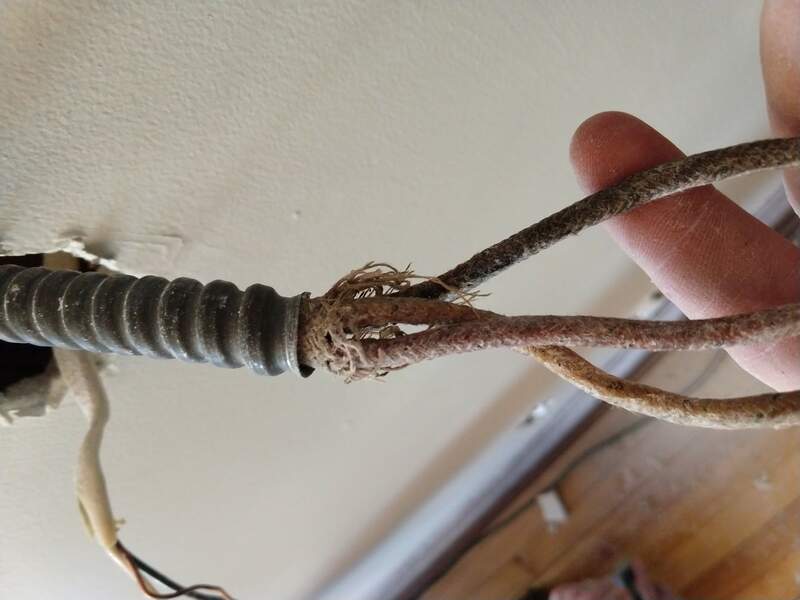 This type of wiring was used in the late 1940's, 1950's and early 1960's until a more modern plastic insulation type offered better protection. Bx was known to be the cause of some fires during its use and was outlawed in many municipalities. One because as you can see there was no anti-short bushing (sometimes referred to as red devils and other names), which cut the insulation and started a high resistance short. Also when exposed to harsh (outdoor) environments or high heat at a junction it would dry out and crack exposing the bare conductor. Also as I have mentioned before there was no acceptable ground connection. I wouldn't go so far as to say this type of system is alright, but the key is the insulation if it is still malleable and covers the conductor well it should be OK. 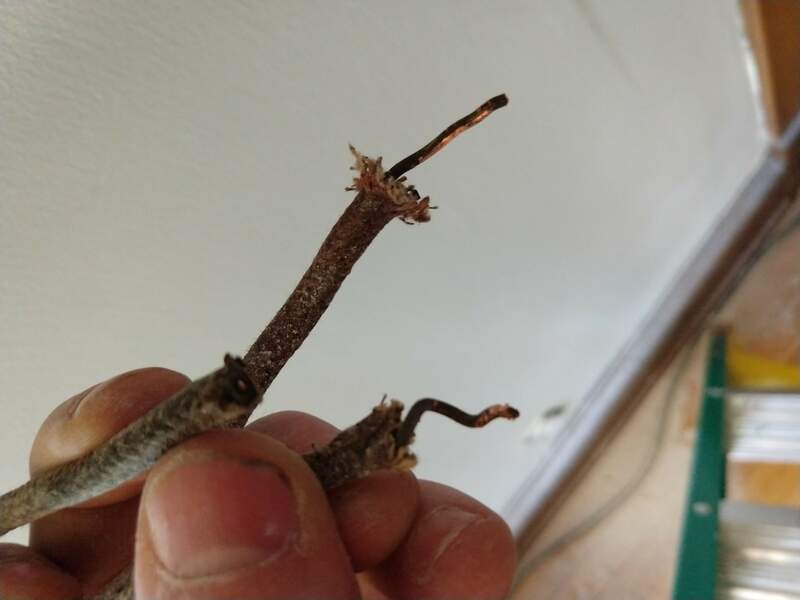 If it shows any sign of drying out and cracking it should be replaced, and if you are reconnecting it back up use the anti-short bushings to protect the wire. That is Armored Cable, or commonly called BX which is a brand. Its from before the widespread use of modern polyethylene and synthetic plastics for insulation on wires. The copper wires in the BX cable are coated in rubber and wrapped in cloth. The issue over time is the rubber becomes dried out, brittle and crumbly. Once its moved around or bent then it can easily break open. Its fine as installed but you should be careful as you work with it. Its easy to crack and then short if anything comes in contact with the copper wire. When bending the wires into a new box you may notice a crack and should wrap that in electrical tape. Your picture is a 3 conductor cable, probably used on a fixture that had a 3-way switch. Black hot, White Neutral, Red is traveler. The metal sheathing of BX cable is the grounding conductor, and this type of cable should be clamped to a metal box. Then your fixture grounding is connect to that metal box or the housing is metal and screwed to the box. It looks like in your picture this isn't a box installed anymore, and there is a Romex cable in the mix. If you intent to keep the BX cable, you'll need to connect the grounds together somehow, such as install a metal box, clamp the metal sheathing into the box, and connect the bare copper ground from the Romex and copper ground wire from your fixture to a pigtail anchored to the metal box. Why are there four electrical lines (12 wires) in this ceiling fan box? How do I separate these wires? What needs to be done to protect existing 12/2 cable in a stud wall being converted to a mass wall? Messed up the wiring in a 3 speed box fan, how can I fix this? What kind of electrical tape is this?